The Learn STEM initiative was launched at the Open University of the Netherlands (OUNL). School teachers and researchers from six countries came together from 22nd to 24th of November 2017. “It is my great pleasure to kick-off the Learn STEM initiative here in our Open University”, said Christian M. Stracke, the coordinator from the Welten Institute of the OUNL. During the intensive three days, all Learn STEM founding members cooperated strongly to define first activities and targets. 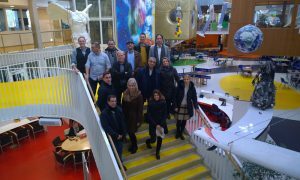 The programme included a visit at the pioneering Agora and Niekée schools in Roermond, also founding partners of Learn STEM: The school headmaster explained their innovative concept without classes, lesson units, curricula and fixed tasks. Afterwards the Learn STEM members could discover the innovations and their impact. Finally, all school teachers and researchers agreed on the need for such exciting innovations. Thus, the development, adaptation and profiling of a pedagogical model is the first objective to forster and improve STEM learning and teaching in Europe and worldwide. ← Welcome to Learn STEM!